This detail is from the Blanchard and Langdon map of 1761, the first New Hampshire map to show town boundaries throughout the Province. The engraving was based on a manuscript map dated 1757, and its names and town outlines are those of the mid-1750s. The map shows a considerable change from the first map in this collection: all land in Cheshire County has been divided into townships, and many names and town boundaries have been changed. This map shows our region after New Hampshire chartered the Massachusetts towns and granted three of its own. It also shows the seven towns in Cheshire County which were granted by the Masonian Proprietors. Nine of the towns shown on the map had settlers in the mid-1750s, when the data for the map was collected. The curved line through the middle of the map is the Masonian Patent Line, the western boundary of a huge private landholding. The owners of the “patent”, the Masonian Proprietors, granted seven towns which came to be part of Cheshire County. These towns surrounded Mount Monadnock, and were named after it: Monadnock No. 1 (Rindge), No. 2 (Jaffrey), No. 3 (Dublin and part of Harrisville), No. 4 (Fitzwilliam), No. 5 (Troy and Marlborough), No. 6 (Nelson and parts of Harrisville, Sullivan, and Roxbury), and No. 7 (Stoddard). The Masonian Patent Line is still recognizable in some boundaries today. 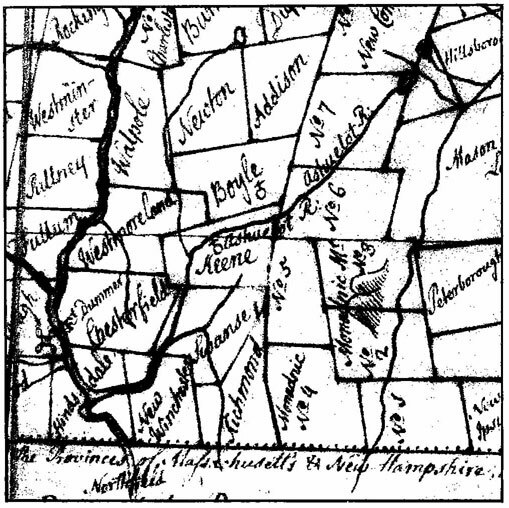 To the west of the Masonian line, above Keene, are three towns, Boyle, Addison, and Newtown, which were established by New Hampshire’s government at the same time the Masonian Proprietors were making their grants. (Boyle is now Gilsum and parts of Sullivan and Surry; Addison and Newtown are Marlow and Alstead.) The map shows other New Hampshire towns to the north and west of Cheshire County. The territory west of the Connecticut River was also claimed by New York; decades later it became the state of Vermont. At the top of the map, in what is now the Plainfield-Cornish area, is the entry: “Choice White Pines and Good Land.” Large white pines, valuable as mast trees for the British navy, may have been taken from this far up the Connecticut River valley. At the bottom of the map, spanning the river, is Hinsdale, the only town to occupy both banks. 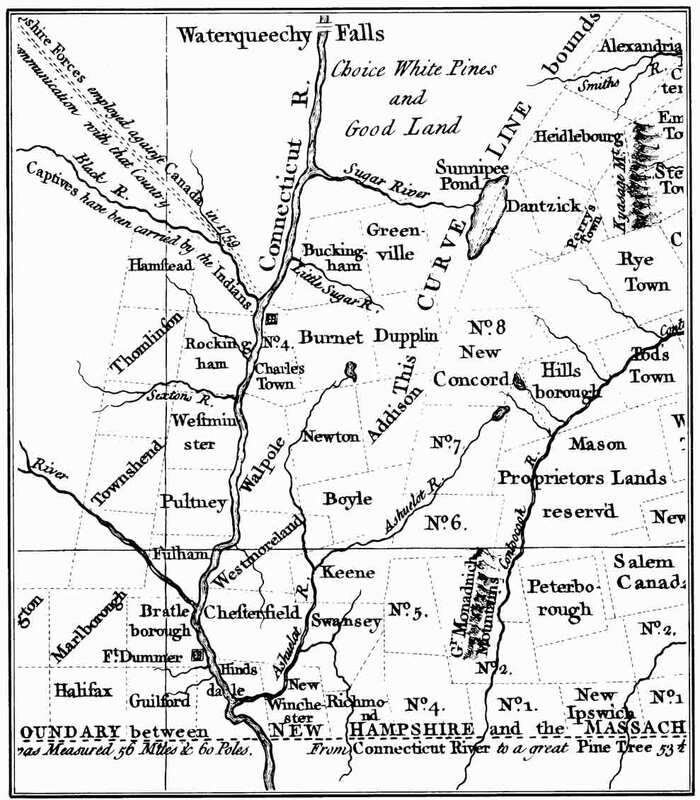 Hinsdale’s boundaries derived from Northfield, Massachusetts, which similarly spanned both banks, and at one time extended above the Ashuelot River.